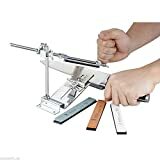 If you are working in different locations and conditions and need to cut various materials while on the move, a portable band saw will very often be the tool of choice. However, if you are in the market for buying the best portable band saw in 2018, which of the many brands and products should you opt for? Milwaukee or Dewalt? Makita or a Stout? (the list of manufacturers is long) these companies all produce excellent tools that are small, lightweight and easy to use. However, there are various factors that need to be considered. Price, weight, features, and portability, should all be factored in before you part with your hard earned money. Well in true Sharpen-up form, we aim to help you in your search. Our top 5 portable band saw picks can be easily viewed in the table below. Beyond that you can read our in depth reviews and analysis of each, along with lots of other helpful info. 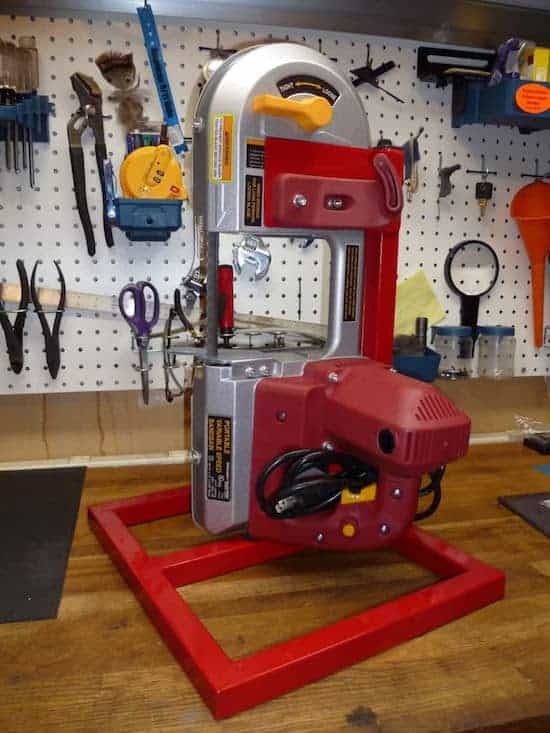 The portable band saw is an ideal addition to any electrician or carpenter’s kit, with a range of options available for the professional tradesman or hobbyist alike. The convenience that a portable model has over a stationary saw is rather obvious to state. The fact is if you need a band saw for use while moving from job to job, the portable band saw is the tool for you. 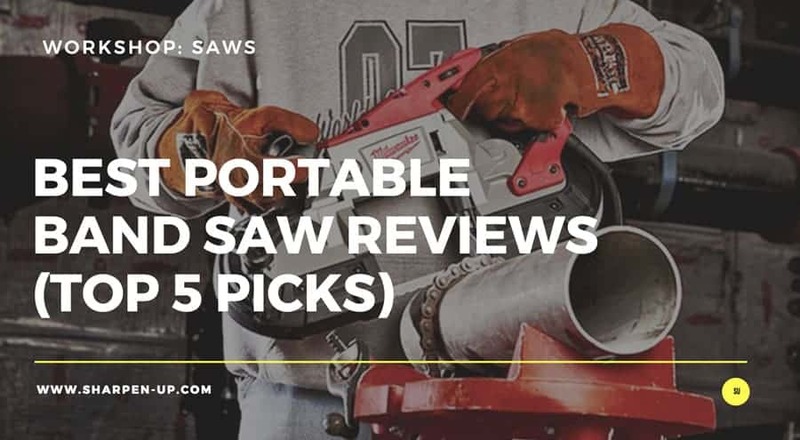 As you would expect from the fact they have made our top 5 list, each of the band saws reviewed in this article is a quality hand tool, designed to make your job easier. 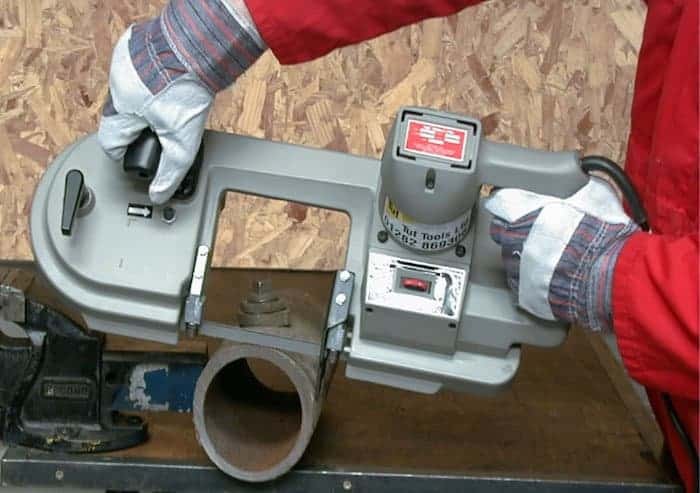 Cutting curves, cross cutting, beveling, ripping or slicing through thick material such as 4″ thick lumber or metal tube is a joy once you are armed with the correct equipment. 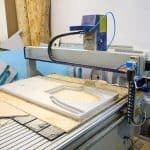 So how do you go about buying the right portable band saw for you? 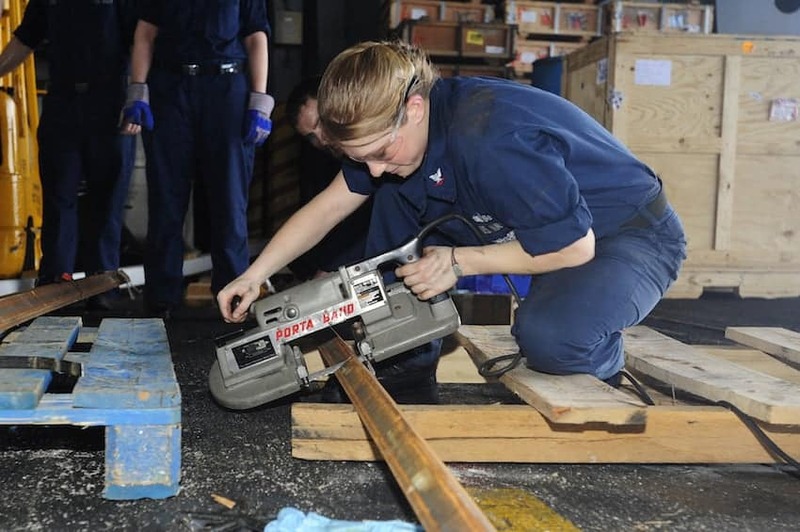 Band saws that are designed to be portable are generally used horizontally for cutting. However, there are also band saws available that use clamp attachments to offer greater stability and convenient cutting. These attachments hold the saw in the vertical position. 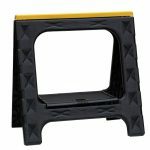 The kit may also come with a portable stand. It is important to consider what type of portable band saw you wish to use before you buy. The best portable band saw will have a variable-speed blade or multi speed setting. This will help you optimize the cutting performance depending on the types and size of the materials you are working with. 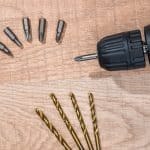 For example, softer materials such as aluminium, cast iron, brass and copper normally require a high speed cutting action, where as plastic pipes, stainless steels and tougher steels should be cut on a slower speed. Essentially, a dual speed portable band saw (if used correctly) will perform better, make neater cuts and will last you longer. It is important not to overlook the importance of blades in the overall performance of your tool. A good blade is essential for efficient, reliable and long lasting cutting. Most portable band saws for sale come with similar length blades, namely 45 inches with a cutting capacity of around 4 ½ inches. The best portable band saws will feature a blade that is strong enough for cutting various materials (i.e wood, metal and plastics). You should also be able to adjust the blade easily enough, with the positioning design being such that the blade does not obstruct your view as you work. If your band saw ticks all of those boxes, you will have a reliable, hard-wearing tool that will allow precise cutting each and every time you use it. A good rule to follow when purchasing a portable band saw and the type of blade to go with, is to look for something that is course, with less teeth per inch, (TPI). This basically allows for faster cutting. Furthermore, opt for a wide blade if you plan on straight cutting thick stock, or a thinner blade if you will be cutting detailed designs and / or tight curves. However, these blade variables also depend on the type of material you will be cutting. If you will mostly be cutting thin materials, a fine-tooth blade (higher TPI) will allow for a cleaner cut. When using any portable band saw it is important to know how much force your tool requires. Handle it wrong and you will quickly end up with slower, less precise cuts, and a blade snapped in half. 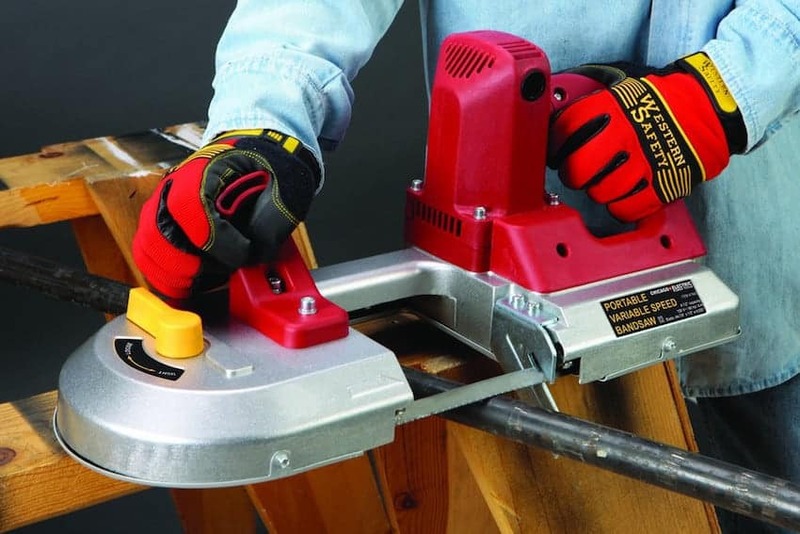 You might want to opt for a portable band saw that is lithium-ion battery operated. Cordless band saws are very popular with those needing to cut out in the field where a constant supply of mains power is an issue. 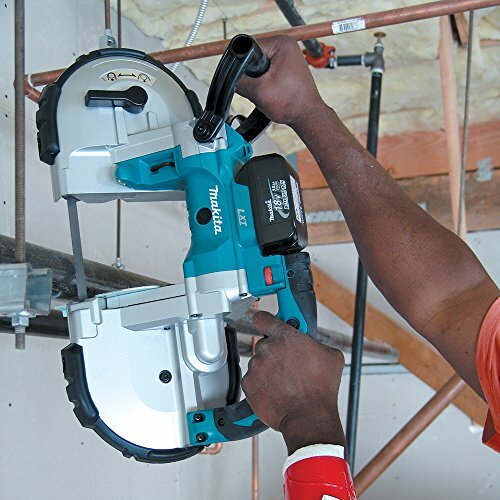 Cordless band saws normally use batteries up to 28 volts. To find out about longevity of battery life you should read portable band saw reviews on the product you are interested in. Very often the comments of actual customers will be the best guide on what’s good and what you should avoid. 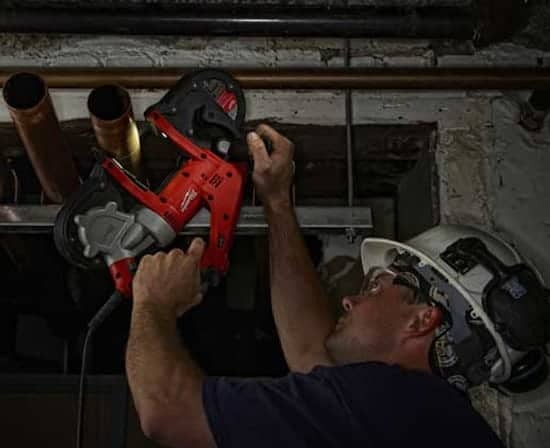 If you prefer the reliability of an electrically powered saw, most portable models come with 6 or 6.5 amp motors, that are simply plugged into a standard electrical outlet via a power cord. Good news is, whatever type you go for, there is no set up required or the need to consult an electrician for professional installation. Portable bandsaws are ready to use straight out of the box, and can be moved and used anywhere you need. 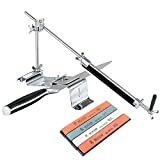 When looking at portable band saws for sale, extra features to make your life easier are always worth checking out. For instance, the tool you have in mind may have a built in work light that is designed to illuminate the cutting area. Some tools are constructed from lightweight materials for easier portability. Handle design is also worth considering. An ergonomic shape for more comfortable extended use is clearly an added bonus. Our top pick portable band saw (non battery powered) is the DeWALT DWM120K. 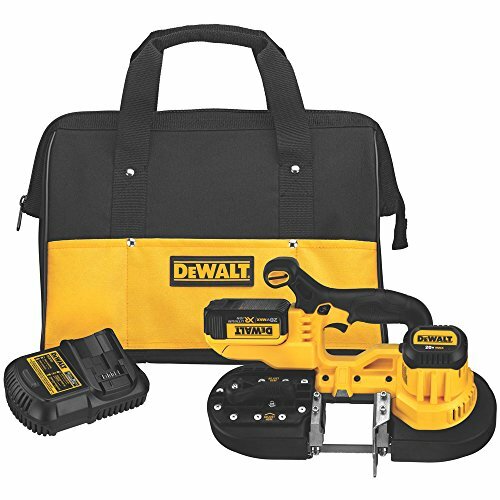 The fact is the Dewalt balances excellent performance, competitive price and all round convenience in one well built and durable package. 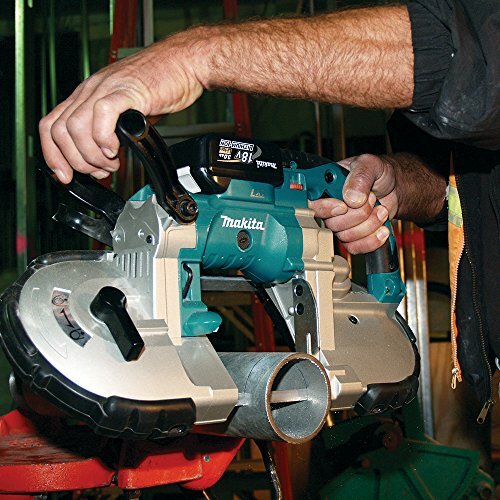 In short, it covers everything you could need from a portable band saw. 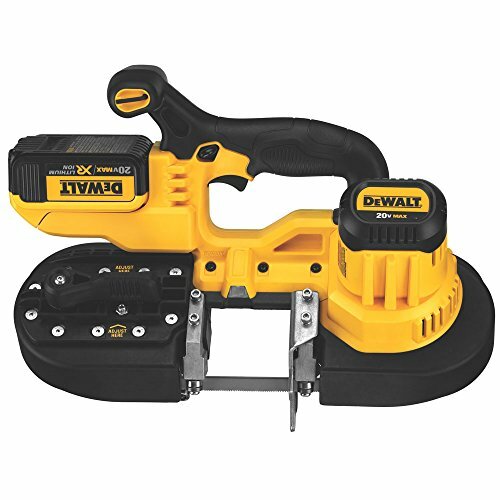 First off the DeWALT comes with a powerful 10 amp motor that can withstand serious cutting. The industry leading 5 inch cut is as deep as you could ever expect from a portable, giving you the capacity to cut round or rectangular stock wherever you are working. The motor is variable speed of course, and has a performance range from 100 sfm to 350 sfm. The easy to use variable-speed dial allows you to select what you need for each cutting application. As we state, the DeWALT is built to last. The steel shroud and rubber bumpers protect the unit from intense jobsite abuse, and can be removed and repaired / replaced as and when is required. Another well thought feature to help ensure your DeWALT keeps on rolling, is the integrated hang hook that allows you to hang the saw without having to put it up and down. As we mentioned in the buyers guide, when looking for portable band saws for sale, you should pay attention to the quality of the blade. Again, this is where the DEWALT DWM120K really excels. The saw’s accurate blade tracking adjustment ensures that blade alignment is at an optimum throughout the entire cut. This reduces unnecessary wear on the blade, while at the same time increasing efficiency and blade life. The dual bearing blade guide rollers also increase overall durability in the blade support system – all leading to a robust tool that works as it should each and every time you pull it out of the case. Changing the blade couldn’t be simpler. A convenient changing lever loosens blade tension, allowing for quick and easy access to swap blades. But how does it feel to operate? Suffice to say, you can have all the features in the world, however if the tool feels terrible in the hand you are not going to want to use it. 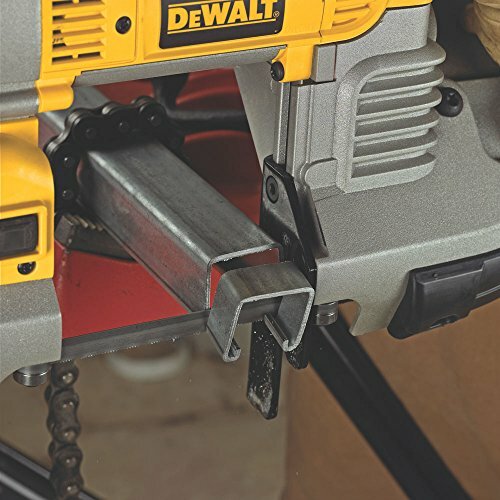 In this regard, the DeWALT is a very nicely balanced portable band saw. Featuring an oversized, multi-position front handle that offers plenty of hand space and easy adjustability, you really do feel in control of this tool as you work. 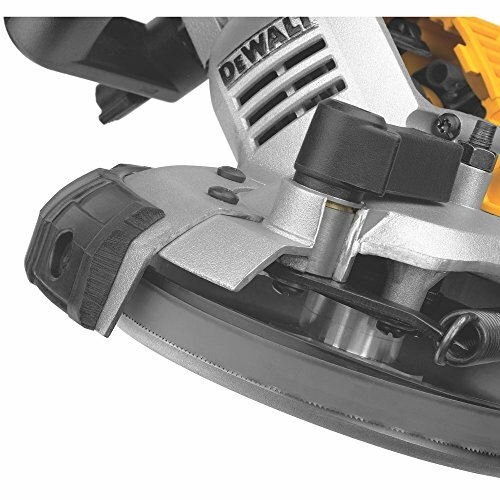 The saw also features a soft grip back handle that compliments the overall balance perfectly. The combined benefits of this careful ergonomic design helps to improve comfort, while reducing user fatigue. A handy LED sight light is housed on the unit to increase user visibility in dark jobsite environments. At the time of writing, the guys over at DeWALT also offer a three-year limited warranty, a one-year free service contract, and a 90-day money back guarantee on this beast. Where and how can you go wrong? An extremely well built and carefully designed portable band saw that gets our coveted number 1 spot for a reason. Powerful enough for a wide range of jobsite tasks, while being comfortable to use and very reliable. An essential purchase. 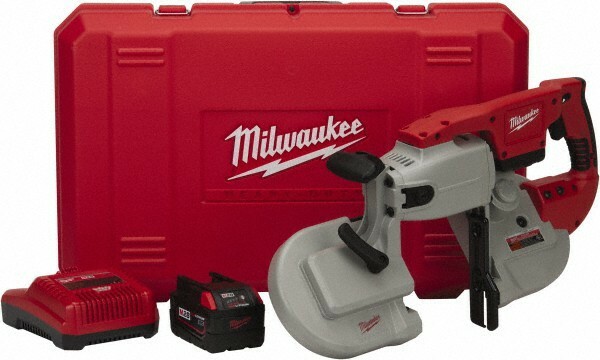 Milwaukee have been churning out power tools of superior quality for years. Their product lines epitomise a strong manufacturing ethos with excellent design each and every time. The same applies here – the Milwaukee 6232-21 is built like a tank yet performs with the delicate control, turbo-charged precision of a ballerina. Okay, the metaphors may have run away with themselves there – however, we cannot dispute the fact that this is a superior tool. Hence it making our top 5 best portable band saw list. The guides twist the blade enabling the user to make perpendicular cuts on pipes and rebar. High quality tool build, with the attention to detail extending to the handle and case design. The Milwaukee is a tad on the heavy side.  User fatigue has been a common complaint with this one. Overall the Milwaukee 6232-21 packs great features, accurate cutting ability, strong motor with an excellent variable speed adjust-ability into one formidable tank-like tool. If you can handle your saw packing a punch in both weight and power, this is the one for you. The Milwaukee Cordless Band Saw, takes our top pick battery powered tool, for fundamental reason – this beast is powerful! The revolutionary 28 volt lithium-ion technology packs an unprecedented punch, providing battery life far and beyond the nearest competitor. The fact you can use this tool with out being anywhere near a electrical outlet and still command this kind of power is extraordinary. But enough of the hyperbole – lets take a closer look at what we are dealing with here. 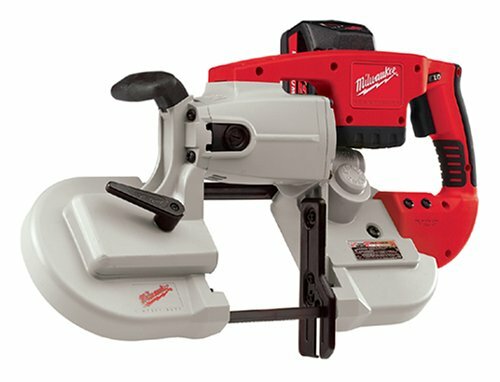 As you would expect with 28V behind it, the Milwaukee 0729 Cordless V28 Portable Band Saw features a high-powered motor specifically designed for optimum performance and precise cutting results. The variable speed trigger delivers cutting speeds of 0-225/0-350 surface-Feet per minute – combined versatility and efficiency really are the go here. The 28-Volt battery Pack has been designed to minimise weight, (the manufacturers claim that it weighs less than an 18-Volt Pack – yet delivers two times the run-time), thus ensuring user fatigue is not an issue with this tool. Furthermore, the larger battery is positioned in a way that does not compromise balance or visibility in the line of site to the cutting area. The Milwaukee has been designed to facilitate the deep cut, with a cutting capacity of 4-3/4 in. While not quite in the same league as our top pick DeWALT, this depth still makes the Milwaukee a versatile tool while out on site. Extra features include a built in LED light for increased illumination in dark work conditions. LED light, comfortable handle and excellent box design make this the all in one portable package you need. Read the small print on what comes supplied before you buy. Some offers will require you to buy the blades separately. Turbo charged battery capacity on an extremely well built tool from industry leaders Milwaukee. It’s difficult to fault this. If you are in the market to buy the best cordless band saw than this is the model for you. 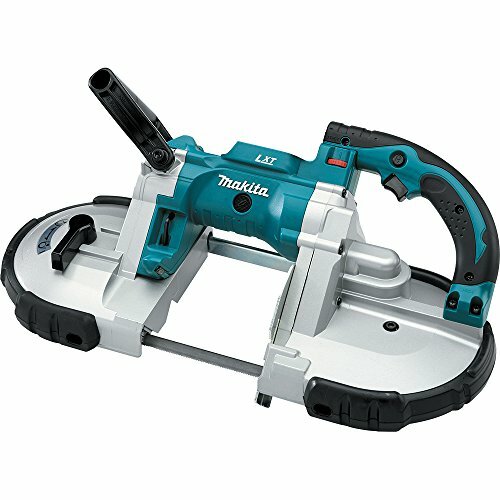 The Makita 18V LXT Lithium-Ion Cordless Portable Band Saw is an all round quality tool, that bites at the heels of the Milwaukee 6232-21 Deep Cut in many ways. Furthermore, as a metal cutting cordless band saw it really does come into its own. 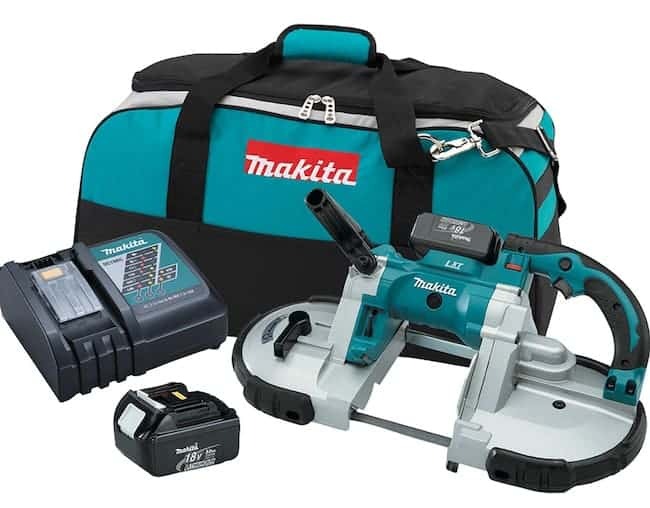 The power under the hood stems from Makita-built high torque motor. Considering this thing can work off an 18v battery, the strength of the cut is very impressive. Add the fact the motor features 6-setting variable speed capabilities, (all accessed from an easy to use control dial that delivers a no load speed of 275-530 ft./min) and you have an extremely versatile tool that can handle a wide range of cutting tasks. Special mention needs to go to the battery performance on this saw. The Makita 18V LXT battery boasts an extremely fast charge time, meaning you spend your time on site working rather than waiting. All that power has been engineered into a compact design of 20-5/8″ long. The complete unit with battery in place weighs just 14.3 lbs. This helps reduce user fatigue and overall operator comfort. Extra features include an inbuilt in L.E.D. light that illuminates the work area as well as rubber bumpers and a removable hook. All round reliable portable band saw that has been engineered for a range of metal cutting tasks. If your use of the tool is work specific, it could be the top choice for you. However, if you are after more versatility, the DeWALT or Milwaukee options may be better choices. The DeWALT DCS371M1 20V Max Lithium Band Saw Kit makes our top 5 list for being a superior cordless band saw. However, it loses out to the Milwaukee on two issues – namely at the time of writing the price point is significantly higher and the battery power and longevity is inferior. 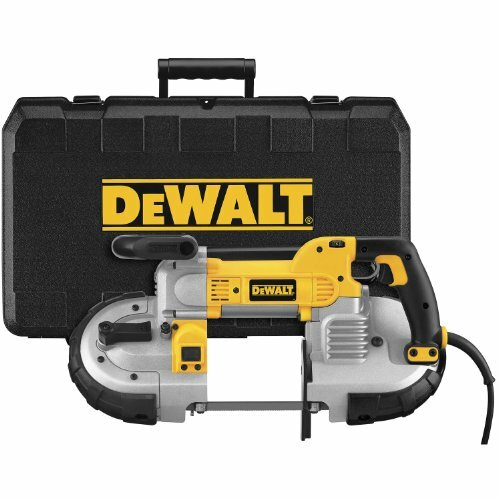 First off, the DeWALT designed and built 20-volt motor will cut the hardiest of materials with little sign of lag or burnout. True the cut is a couple of inches short when compared to the Milwaukee, (you’re getting a 2-1/2″ cut capacity, and the ability to cut up to 2″ SCH 40 pipe on the DEWALT), however precision based work is the name of the game here. The ergonomically designed unit features a centered handle position for superior balance, allowing the user to guide the saw with increased control. This, combined with a special blade tracking adjustment system (that extends blade life and performance) provides an optimum level cutting performance no matter your working environment. The dual bearing blade guide rollers provide increased durability in the blade support system. 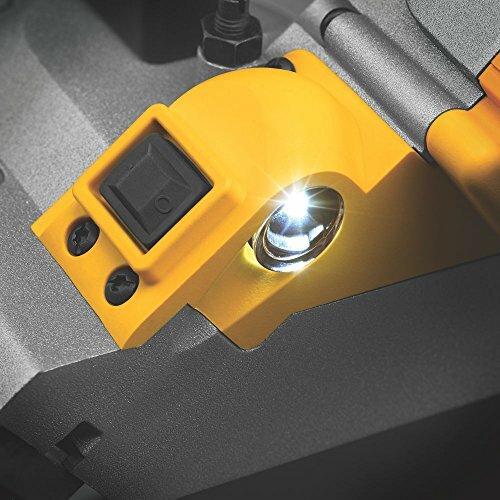 Extra features include a LED Work Light with 20-second delay and an integrated hang hook to hang the saw without damaging the front handle or base. 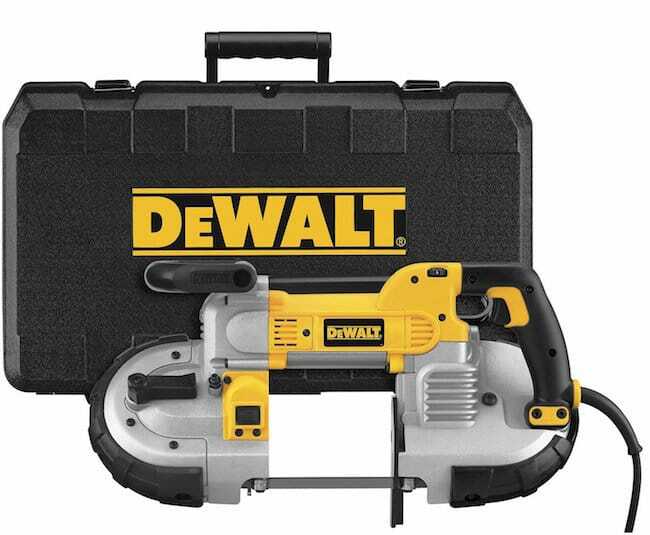 Top of the range DEWALT engineering in a formidable cordless band saw package. 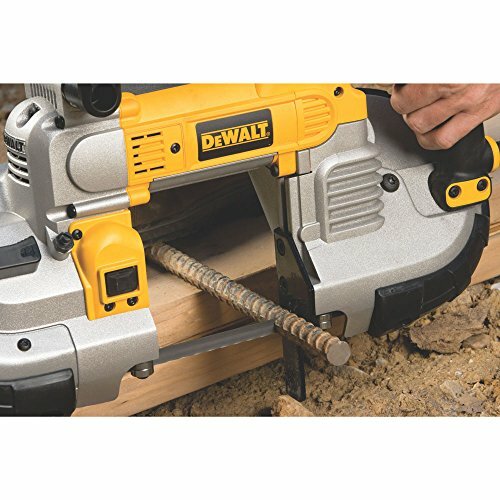 It may not quite have the power and deep cut of the Milwaukee alternative, however fans of the DeWALT brand will not be disappointed. We have already covered this above to some degree in the best portable band saw buyers guide. Remember, when cutting thicker materials a course blade with a lower teeth per inch should be used. 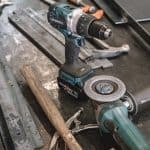 This is obvious to say, however many operators of any type of power tool seem to forget that the reason you are using such a tool, is to save yourself the muscle power. Avoid leaning on the tool in the hope that you will cut through your materials faster. Adding too much of your own force on top of what the band saw is doing is a sure fire way of wrecking your blade and creating poor quality cuts. For better all round performance and a longer shelf life, keep your tool and its guide rollers clean. Material shavings and dust should be blown free of your work space as you work, and always ensure you have given your band saw a thorough wipe before packing it away after use. If your portable band saw didn’t come with a suitable case, purchase one as an addition. You should opt for a case that has adequate storage for both the saw and your blades, so that everything is kept tidy, clean and in tip-top condition. This is especially important if you want your tool to work at optimum levels. This does not require much. 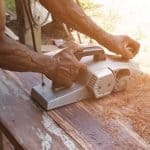 It just means that as you use your band saw on different materials (with differing blades and or speed settings), take a little time to consider what works best in the way of combining these variables with your own handling of the saw. With some consideration and patience you will be executing fast, precision based cuts in no time at all. Only then will you really be getting the best out of your new portable band saw.